Pacific rockfish and steamed nasturtium flowers with tuberous begonia vinegar and pansy oil. Put a medium-size steamer over high heat and bring to a boil. 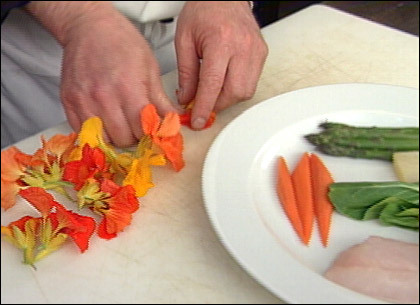 Place nasturtium flowers over each fillet. When the water has reached a boil, place the fillets in the steamer. Steam for 4 to 6 minutes, depending upon the thickness of the fish, or until the fish begins to flake. 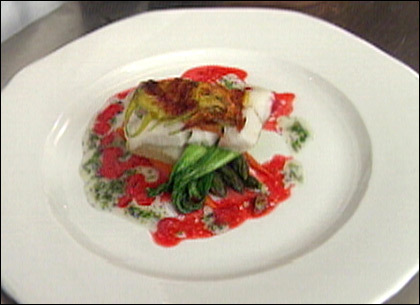 Remove the fish from the steamer and place on a plate. Drizzle 1 tablespoon of pansy oil (see recipe below) and 1 1/2 tablespoons of tuberous begonia vinegar (see recipe below) around the plate and serve. Place the pansies in a blender at high speed and add oil. Blend for 1 minute. Pour the mixture into a non-corrosive container or glass jar and refrigerate for 1 hour. Remove the oil from the refrigerator 15 minutes prior to serving to bring up to room temperature. Put the flowers, apple juice, honey and red wine vinegar in a blender and blend at high speed until the mixture is smooth. Remove the vinegar from the refrigerator 15 minutes prior to serving to bring up to room temperature. Chef's Warning: Be sure to use tuberous begonias Begonia x tuberhybrida. The petals contain oxalic acid. Eat them in moderation. Do not eat petals from any other begonias, only hybrid tuberous begonia flowers are edible. Wax begonias are carcinogenic. Do not use sprayed flowers from florists, non-organically grown flowers or flowers that you are not sure are edible. Many flowers are poisonous and some poisonous flowers share common names that are similar or the same as flowers that are safe to consume. Creasy, Rosalind, Cooking From The Garden, Sierra Club Books, San Francisco. Barash, Cathy Wilkison, Edible Flowers From Garden to Palate, Fulcrum Publishing, 1993. This segment appears in show #2814.